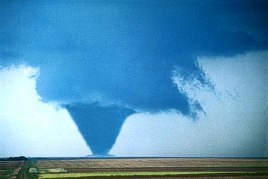 A tornado is a violently rotating (usually counterclockwise in the northern hemisphere) column of air descending from a thunderstorm and in contact with the ground. Although tornadoes are usually brief, lasting only a few minutes, they can sometimes last for more than an hour and travel several miles causing considerable damage. Tornadoes are the #3 most hazardous aspect of thunderstorms (#2 is lightning). In a typical year around 1200 tornadoes will strike the United States. The peak of the tornado season is April through June with more tornadoes striking the central United States than any other place in the world. This area of the country has been nicknamed "tornado alley." Most tornadoes are spawned from supercell thunderstorms. Supercell thunderstorms are characterized by a persistent rotating updraft and form in environments of strong vertical wind shear. 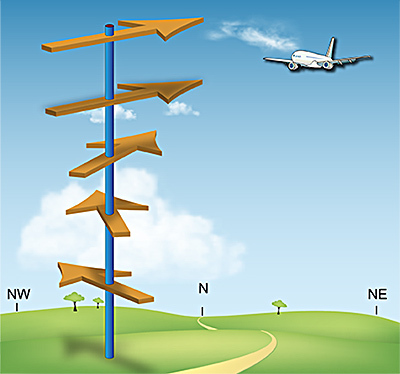 Wind shear is the change in wind speed and/or direction with height. Directional wind shear is the change in wind direction with height. In the image below, the view is looking north. The wind near the surface is blowing from the southeast to the northwest. Speed shear is the change in wind speed with height. In the illustration below, the wind is increasing with height. This tends to create a rolling affect to the atmosphere and is believed to be a key component in the formation of mesocyclones which can lead to tornadoes. 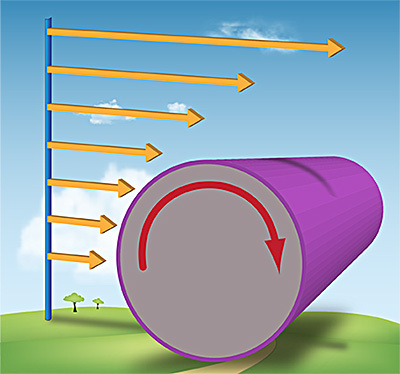 Strong vertical shear is the combination of a veering directional shear and strong speed shear and is the condition that is most supportive of supercells. Wind speed changes with height. The updraft lifts the rotating column of air created by the speed shear. This provides two different rotations to the supercell; cyclonic or counter clockwise rotation and an anti-cyclonic of clockwise rotation. The directional shear amplifies the cyclonic rotation and diminishes the anti-cyclonic rotation (the rotation on the right side of the of the updraft in the illustration - located right). All that remains is the cyclonic rotation called a mesocyclone. By definition a supercell is a rotating thunderstorm. When viewed from the top (left image), the counter-clockwise rotation of the mesocyclone gives the supercell its classic "hook" appearance when seen by radar. As the air rises in the storm, it becomes stretched and more narrow with time. The condensation funnel may not be visible all the way to the ground. The exact processes for the formation of a funnel are not known yet. Recent theories suggest that once a mesocyclone is underway, tornado development is related to the temperature differences across the edge of downdraft air wrapping around the mesocyclone. However, mathematical modeling studies of tornado formation also indicate that it can happen without such temperature patterns; and in fact, very little temperature variation was observed near some of the most destructive tornadoes in history on May 3, 1999 in Oklahoma. Large and very destructive tornado. The funnel cloud of a tornado consists of moist air. As the funnel descends the water vapor within it condenses into liquid droplets. The liquid droplets are identical to cloud droplets yet are not considered part of the cloud since they form within the funnel. The descending funnel is made visible because of the water droplets. The funnel takes on the color of the cloud droplets, which is white. Due to the air movement, dust and debris on the ground will begin rotating, often becoming several feet high and hundreds of yards wide. After the funnel touches the ground and becomes a tornado, the color of the funnel will change. The color often depends upon the type of dirt and debris is moves over (red dirt produces a red tornado, black dirt a black tornado, etc.). 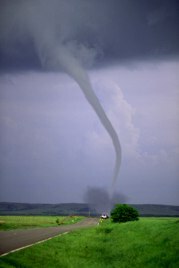 Tornadoes can be thin and rope-like. Tornadoes can last from several seconds to more than an hour but most last less than 10 minutes. The size and/or shape of a tornado is no measure of its strength. Occasionally, small tornadoes do major damage and some very large tornadoes, over a quarter-mile wide, have produced only light damage. The tornado will gradually lose intensity. 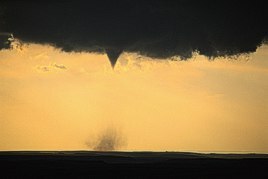 The condensation funnel decreases in size, the tornado becomes tilted with height, and it takes on a contorted, rope-like appearance before it completely dissipates. 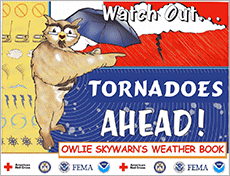 Learn more about tornadoes from the NWS Storm Prediction Center's FAQ. The Fujita (F) Scale was originally developed by Dr. Tetsuya Theodore Fujita to estimate tornado wind speeds based on damage left behind by a tornado. An Enhanced Fujita (EF) Scale, developed by a forum of nationally renowned meteorologists and wind engineers, makes improvements to the original F scale. This EF Scale has replaced the original F scale, which has been used to assign tornado ratings since 1971. The original F scale had limitations, such as a lack of damage indicators, no account for construction quality and variability, and no definitive correlation between damage and wind speed. These limitations may have led to some tornadoes being rated in an inconsistent manner and, in some cases, an overestimate of tornado wind speeds. The EF Scale takes into account more variables than the original F Scale did when assigning a wind speed rating to a tornado. The EF Scale incorporates 28 damage indicators (DIs) such as building type, structures, and trees. For each damage indicator, there are 8 degrees of damage (DOD) ranging from the beginning of visible damage to complete destruction of the damage indicator. The original F Scale did not take these details into account. For example, with the EF Scale, an F3 tornado will have estimated wind speeds between 136 and 165 mph (218 and 266 km/h), whereas with the original F Scale, an F3 tornado has winds estimated between 162-209 mph (254-332 km/h). The wind speeds necessary to cause "F3" damage are not as high as once thought and this may have led to an overestimation of some tornado wind speeds. There is still some uncertainty as to the upper limits of the strongest tornadoes so F5 ratings do not have a wind speed range. Wind speed estimations for F5 tornadoes are left open ended and assigned wind speeds greater than 200 mph (322 km/h). This video is from January 7, 2008 when a tornado crossed the Chicago and Northwestern Railroad and blew 12 moving railroad cars off the tracks near the town of Lawrence, Il. The train enters the rain from the parent thunderstorm around 0:33. The wind begins to pick up around 0:53. At 1:04 a gray blur can be seen, most likely the tornado striking the train several cars back with domino effect pulling the last car off the track at 1:09. The remaining cars on the track slam into the front part of the train.